Physical Security Planning. Vulnerability Assessments. Security Design and Planning. Security Construction Projects. Protection in Depth. Perimeter Protection. Access Control. Physical Protection Systems. CCTV and IP Video. Keys, Locks, and Safes. Biometrics. Security Guard Force. Central Station Design. Government Security. Financial Institutions and Banks. Data Center Protection. Total System Cost. Security Master Plan. Security Foresight. Security Leadership. Index. Dr. Paul R. Baker began his security career in the U.S. Marine Corps as a military policeman. Upon discharge, he joined the Maryland State Police and worked in all phases of law enforcement, spending the majority of his career in the intelligence and narcotics areas. Upon retirement in 2001, he began the security management phase of his journey, working for the MITRE Corporation, Institute for Defense Analysis, Capital One Bank, and, finally, with the RAND Corporation. Dr. Baker is board certified in security management as a certified protection professional (CPP) by ASIS (American Society for Industrial Security) International. He is an adjunct professor for University of Maryland University College in the homeland security field and an adjunct professor for Southwestern College in its security management curriculum. 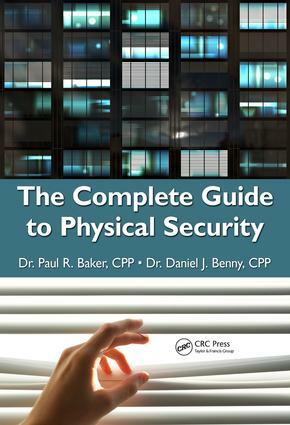 He is a contributor to the CRC Press books Official (ISC)2 Guide to the CISSP CBK, Second Edition and Official (ISC)2 Guide to the ISSAP CBK. Dr. Daniel J. Benny is the security discipline chair at Embry-Riddle Aeronautical University. He served as a U.S. Navy intelligence officer and DOD Federal Police Chief and holds a Ph.D. in Criminal Justice from Capella University. He is board-certified in security management as a certified protection professional (CPP) and board-certified as a professional certified investigator (PCI)-both by ASIS International; certified fraud examiner (CFE) by the Association of Certified Fraud Examiners; certified confidentiality officer (CCO) by the Business Espionage Controls and Countermeasures Association; certified member (CM) airport certified employee-security (ACE); and airport security coordinator by the American Association of Airport Executives.